Welcome to Pre-primary section. 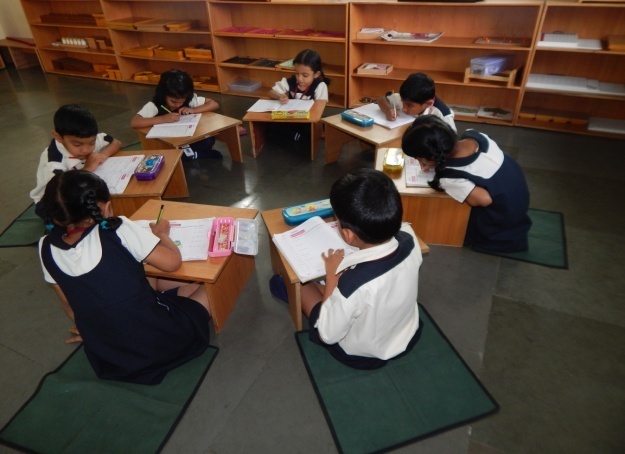 We, at Carmel Academy, follow Montessori and Kindergarten systems as two streams of teaching-learning methodologies at the pre-primary level. What is Montessori Method of Education? It is an advanced ‘Teaching-learning method’. Dr. Maria Montessori believed that children acquire specific skills more easily during the sensitive period (Example - sensitive period of writing, reading, etc.). Teachers should observe and detect this period of sensitivity and offer the activities accordingly. This is a place where children are specially prepared to work with materials all by themselves. It is here that the children can choose their own materials and work with them until they gain mastery over it. Children who are actively involved in a prepared environment and can choose their own materials to work with are literally educating themselves. We offer activities such as, spooning, pouring, etc. under this category. In the Montessori house of children, these activities are offered as child developmental activities. They are simple, clear and have a concrete purpose so that a child can understand them easily and perform the activities in a short span of time. The child consolidates and develops coordination of the movements by performing these activities thus laying the foundation for the integration of the personality. Montessori sensorial materials are materials used in the Montessori classroom to help a child develop and refine his /her five senses. Sensorial activities are offered with the aim of total development of the child. The Purpose of the sensorial education is to enable the child to acquire clear and conscious information, and be able to classify things in his environment. Activities like: cylinder blocks, Pink tower, etc. are offered in this category. Language refers to a way of communication such as speaking, reading and writing. In the Montessori environment, a child consolidates his/her already constructed language and acquires new skills of reading and writing. To enhance their language skills, Montessori class offers multiple activities like Oral phonetic analysis, Picture series, Sand paper letter, Association of sounds with symbols, formation of simple words using movable alphabet, reading, etc. Exercises of practical life and Sensorial activities give indirect preparation for the arithmetic activities. Arithmetic materials give further opportunity to learn Mathematical operations. Arithmetic materials are concrete materials. By using these concrete materials, children learn abstract mathematical concepts. It will help them in sequential understanding of the mathematical concepts. Montessori system of education focuses on two basic principles. Firstly, children and developing adults engage in psychological self-construction through interaction with their environments. Secondly, children, especially under the age of six, have an innate path of psychological development. All these are managed by trained Montessori teachers who follow the children and are highly experienced in observing the individual child's characteristics, tendencies, innate talents and abilities.